Showtime will be televising three world title fights on Saturday from two separate locations. 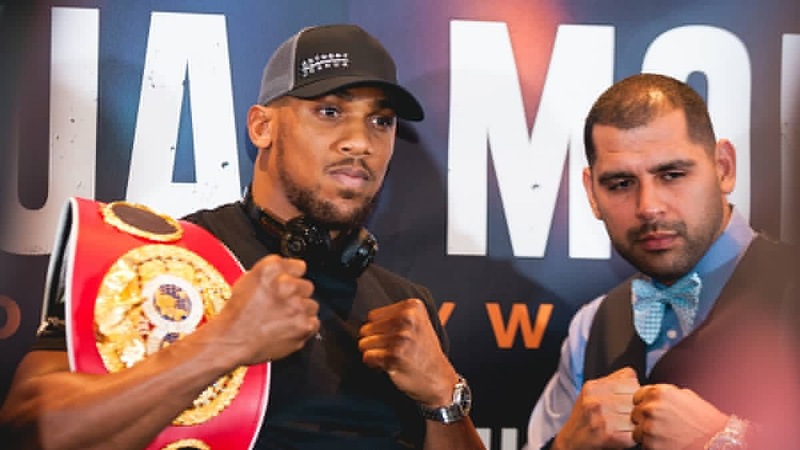 The first bout they will be showing is an IBF Heavyweight Title Bout between Anthony Joshua and Eric Molina in Manchester, England. Coincidentally, HBO will also be showing a heavyweight title bout around the same time. The other two bouts they will be showing is a WBA Featherweight Title bout between Jesus Cuellar and Abner Mares, as well as a very intriguing IBF Junior Middleweight Title bout between Jermall Charlo and Julian Williams. Two of the three bouts should be very competitive and intriguing bouts, with only the heavyweight bout having a clear and hands down favorite. The following is a preview of all three world title bouts. Of the three world title fights that Showtime is televising, this is by far, the biggest mismatch. Eric Molina is thirty four years old and seven years older than his opponent. He will be giving up three inches in reach and two inches in height. He also has three knockout losses and will be facing an opponent that has defeated every single boxer he’s faced as a professional by stoppage. Molina does have nineteen knockouts, but he was unable to stop nine of his opponents. Anthony Joshua has been very active in the past two years. He has already fought twice in 2016 and fought five times in 2015. Molina fought once in 2016 and three times in 2015. Joshua has the edge in amateur experience. He won the gold medal in the Super Heavyweight division in 2012. Joshua will also be fighting in front of a friendly crowd in Manchester, England. The only reason Molina is fighting Joshua is because he scored a huge upset over the veteran Tomasz Adamek in his last fight in Adamek’s home country of Poland. However, his list of notable victories is short. His biggest wins have come against Adamek, DaVarryl Williamson, and Tony Grano. He has lost, by stoppage, to Deontay Wilder, Chris Arreola, and Ashanti Jordan. Joshua has defeated the likes of Dominic Breazeale, Charles Martin, Dillian Whyte, Gary Cornish, and Kevin Johnson. Every single victory that Joshua has earned has come by way of stoppage. Every single loss that Molina has suffered has come by way of stoppage. The expectations are that those trends will continue. Abner Mares has had recent issues with his eyes and it has been questioned if he should ever fight again. Mares is a good boxer, but he’s a former bantamweight world champion and is likely fighting in a higher weight class than he should be. Mares will be giving up an inch and a half in height to Jesus Cuellar and will be giving up two inches in reach. Cuellar also has the edge in power. He has twenty one stoppage victories, all at a higher weight class than what Mares is used to competing in. Mares’ power hasn’t followed him as he’s gone up in weight classes but he still has fifteen stoppage victories. Mares is two years older than Cuellar, but has been in the ring with some of the best bantamweights the sport of boxing has to offer. His losses were to Leo Santa Cruz and Jhonny Gonzlaez. He has defeated the likes of Daniel Ponce De Leon, Jonathan Oquendo, Anselmo Moreno, Eric Morel, Joseph Agbeko, and Vic Darchinyan. Cuellar hasn’t fought the same level of competition that Mares has fought as a professional, but he still has an impressive resume. He has defeated Jonathan Oquendo, Vic Darchinyan, Ruben Tamayo, Juan Manuel Lopez, and Rico Ramos. His lone loss was in 2011 to Oscar Escandon. The biggest question mark about Cuellar on Saturday will be ring rust. He had no fights in 2016 and will be in the ring with an experienced opponent. Mares does have the edge in amateur experience. Cuellar experienced some success in regional tournaments as an amateur, but Mares represented Mexico in the 2004 Olympics. Mares career appears to be on the downside of his career. He’s good enough to make the fight competitive and close with Cuellar, but Cuellar is the naturally bigger boxer and should be considered the favorite. If you talk to anyone involved in the Philadelphia boxing scene, they will tell you that Julian “J-Rock” Williams is one of Philadelphia’s best boxers and has the potential to be a world champion. That reputation may have hurt Williams’ chances at securing a title shot as he has been avoided by many the past two years, but he’ll get his first chance at a world title against a very dangerous champion. Jermall Charlo, one half of the Charlo twins, is the same age as Williams but will have a one inch height and a one inch reach advantage over Williams. He also has more knockout victories. He has stopped eighteen of the boxers he’s faced while Williams has only stopped fourteen. They both had good amateur careers, but neither can claim any international amateur success. Charlo has the more impressive professional resume. He has defeated the likes of Austin Trout, Wilky Campfort, Cornelius Bundrage, and Antwone Smith. Two of Charlo’s past four fights were stoppage victories. Williams has had trouble attracting a top name opponent into the ring with him, but he has beaten fighters such as Marcello Matano, Luciano Leonel Cuello, Joey Hernandez, Freddy Hernandez, and Joachim Alcine. However, William’s power appears to be improving as he has stop four of his past five opponents. 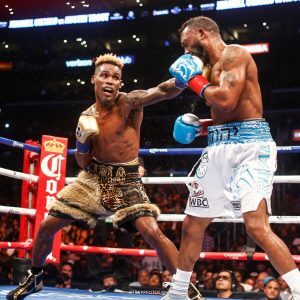 Everything on paper appears to suggest that Charlo should be the favorite on Saturday, but Williams has been avoided for a reason, and this writer believes Williams will win the IBF Junior Middleweight Title on Saturday. The following is the Boxing Insider notebook for the week of November 29th to December 6th, covering the comings and goings in the sport of boxing that you might have missed. 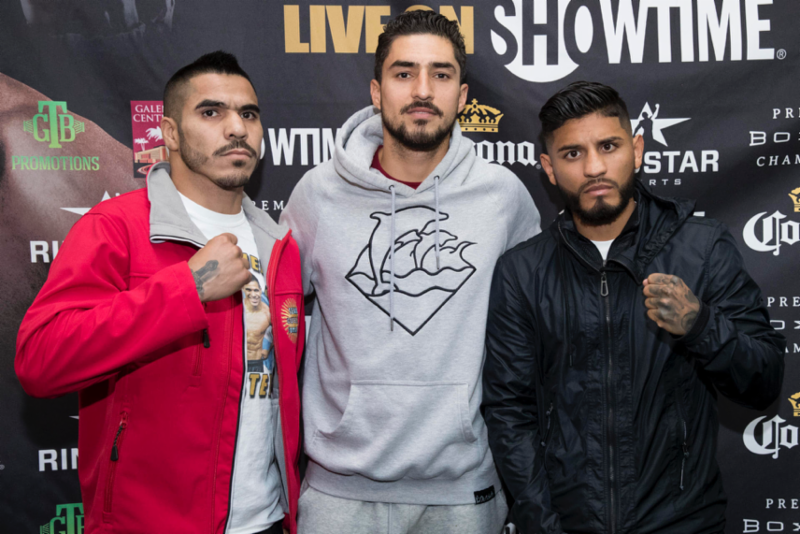 Featherweight world champion Jesus Cuellar and former three-division world champion Abner Mares participated in a media workout in Los Angeles Tuesday in advance of their long awaited showdown taking place Saturday, December 10 from Galen Center in USC in Los Angeles and live on SHOWTIME. Split-T Management is pleased to announce the signing of another member of the 2016 United States Olympic Team, Antonio Vargas to a managerial contract..
Vargas of Kissimmee, Florida was the Flyweight representative for the 2016 U.S. Team. “I have known Split-T Management’s David McWater for several years. The people I know told me a lot of positive things about him. He showed me he was a good person and the man who can manage my career the way it should be,” said Vargas. He was considered one of the best pound for pound fighters on the squad, and the most successful amateur of the team heading into the games. He was a U.S. Youth Open champion, U.S. National Elite champion, two-time National Golden Gloves champion and won the Gold Medal at the Pan American Games at the age of 18. Those accomplishments led him to be named the 2015 USA Boxing Male Athlete of the Year. In the 2016 Olympics, Vargas lost to eventual Gold medal winner Shakhobibdin Zoirov of Uzbekistan. Vargas will turn professional at either 115 or 118 pounds and his handlers believe that he will fight up to junior lightweight before his career is complete. Vargas has a very exciting style, and he has taken traits from some of the best fighters in the world that he feels makes him a complete fighter. Vargas began boxing at age nine. As Vargas grew older, boxing became more of a future then just an activity. Vargas believes that all of his international experience will help him in the pros because he was exposed to the many different styles of boxing, and now he is extremely motivated due to his Olympic experience. “I plan on turning professional as either a junior bantamweight or bantamweight and win world championships in four different weight divisions. I am going to achieve greatness while glorifying Jesus Christ and to spread his word. Fresh off a dominant TKO victory of Zoltan Sera last month in Philadelphia, Derrick “Take it to the Bank” Webster (21-1, 11 KOs) will make a return to the ring on Jan. 21st at the Sun National Bank Center in Trenton, N.J. Standing opposite him that night will be Thomas Awimbono (25-5-1, 21 KOs), with the IBO Super Middleweight Championship on the line. With the IBO Super Middleweight Championship on the line, Webster says that the intensity surrounding this camp is already at an extreme level. A newly married man, Webster quickly put to rest any concerns regarding his mental focus in his last fight, where he knocked down Sera three times before a referee stoppage in the 5th round. The card on Jan. 21st is being promoted by Renee Aiken, someone who has been a consistent ally of Webster throughout his career. Webster vs. Awimbono will be the co-feature bout on the Jan. 21st card, with former four-time world champion Zab Judah making his return to boxing in the main event. Rayne, Louisiana’s “Rock Hard Mighty” Mason Menard (32-1, 24 KOs) knows he’s in for a tough challenge when he makes the first defense of his WBO NABO Lightweight Championship against fellow top-10 contender Ray Beltran (31-7-1, 19 KOs) of Phoenix, Arizona, on Saturday, December 10, at CenturyLink Center Omaha in Omaha, Neb. The 10-round Menard vs. Beltran lightweight showdown will serve as the middle bout of an HBO World Championship Boxing tripleheader (9:35 p.m. ET/PT) that will open with the same-day delay telecast of the Joseph Parker vs. Andy Ruiz, Jr. WBO heavyweight championship in New Zealand. Promoted by Top Rank®, in association with TGB Promotions, the exciting event will be headlined by undefeated World Junior Welterweight Champion and top-rated pound-for-pound fighter TERENCE “Bud” CRAWFORD (29-0, 20 KOs), of Omaha, Neb., making the first defense of his unified World Boxing Organization (WBO) / World Boxing Council (WBC) /Ring magazine 140-pound world titles against one-time world title challenger and current No. 1 contender JOHN MOLINA JR. (29-6, 23 KOs), from Covina, Calif. Remaining reserved seat tickets to the Crawford – Molina world championship event, priced at $27, $52, $77 and $127, can be purchased at the CenturyLink Center Omaha box office and all Ticketmaster outlets. To charge-by-phone call (800) 745-3000. To order online, visit ticketmaster.com. 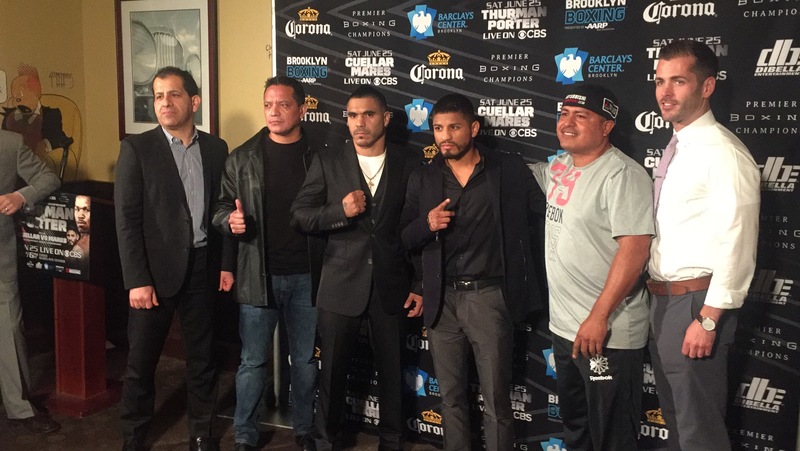 “I know Beltran has been around a long time and he’s fought at the top level many times. He is very tough and I know he will bring it,” said Menard. The 28-year-old Menard punched his way into world contention this year with a pair of high-profile knockouts. In April of this year, he scored one for the highlight reels by starching formerly undefeated Eudy Bernardo with one punch in round three. Then in August, he returned with another KO, this time against well-regarded Uzbekistani Bahodir Mamadjonov in the ninth round. 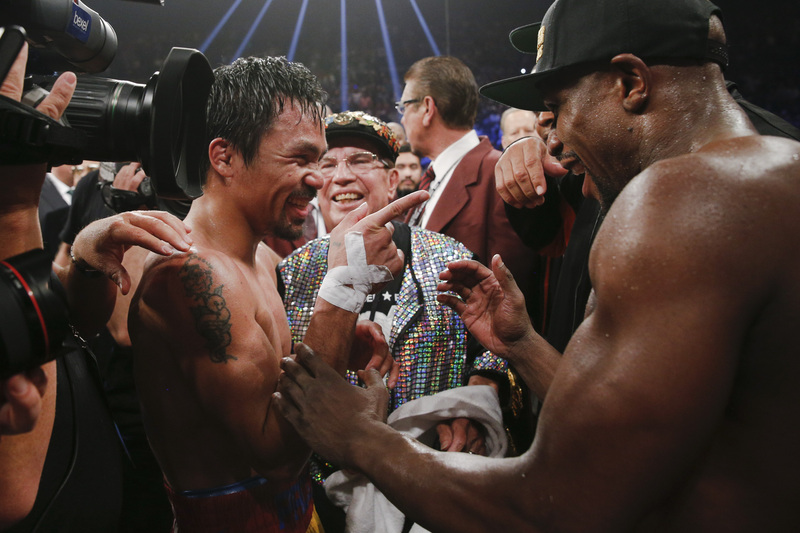 Boxing Insider Notebook: Ward, Pacquiao, Mares, Cuellar, Farmer, Joshua, and more…. The following is the Boxing Insider notebook for the week of October 25th to November 1st, covering the comings and goings in the sport of boxing that you might have missed. Boxing’s only eight division world champion and the reigning Fighter of the Decade Senator MANNY “Pacman” PACQUIAO, held a media workout on Wednesday at Wild Card Boxing Club in Hollywood, Calif.
Pacquiao (58-6-2, 38 KOs), from General Santos City, Philippines, is in the final week of training for his world championship collision with World Boxing Organization (WBO) welterweight world champion JESSIE VARGAS (27-1, 10 KOs), of Las Vegas. In just nine days they will go mano a mano and toe-to-toe in a high-stakes welterweight showdown. While Pacquiao will be looking to become a three-time WBO welterweight champion as well as the first senator to win a world title, Vargas will be resolute in enforcing a term limit on the future Hall of Famer’s boxing career. “It took discipline to manage my time effectively … to balance my training camp and my Senatorial duties. I feel good. Every day I was able to get in all my training. I ran every morning and did my strength and conditioning with Justin Fortune. I worked with Freddie every evening at the gym after work. There were some days where I would have to come in later if my work in the Senate demanded I stay longer. Between the two “jobs,” I was averaging 14-hour workdays. Luckily the gym was very close to the Senate so I didn’t have to deal with traffic. I had no real free time to be with friends. “I am now well-rested. I arrived in U.S. on Saturday evening and today I feel I have recovered from my jetlag. I sparred six rounds yesterday [Tuesday with Ray Beltran]. I will spar Thursday, Saturday and Monday before driving to Las Vegas. “I am fighting for history. I was the first sitting congressman to win a world title. For this one, it is not enough to be the first sitting senator to fight for a world title, I want to be the first senator to become world champion. For me, that would be quite an accomplishment. “I want to prove that I am still one of the best pound-for-pound fighters. I feel I still have a lot to prove. I am not done with boxing. I will continue to keep fighting as long as I love boxing and boxing still loves me. I do not feel old. I feel like I am still 27. “I do not underestimate Jessie Vargas. He is a good strong champion. You cannot fight at this level and be successful by underestimating your opponent. Every opponent gets my full attention and respect. I respect Jessie and that is why I trained hard. This is the most important fight because it will determine the direction of my boxing career. I need to win convincingly. “In boxing the fight is in the ring is for the enjoyment of the fans. In the Senate, the fight is for improving the quality of life of the Philippine citizens. Being a senator is inspiring work. “Winning world titles in eight divisions is not that easy. I am so blessed to be a part of boxing history by winning them. That is not me boasting. I am just happy to be a part of the history of boxing. Anthony Joshua MBE is set to defend his IBF World Heavyweight title against Eric Molina at the Manchester Arena on December 10, live on Sky Sports Box Office in the UK and on Showtime in the U.S.
Joshua puts his crown on the line for the second time and fights his third American in a row having destroyed Charles Martin inside two rounds to rip the title from the St. Louis man in April at The O2 in London and then stopping Dominic Breazeale in the seventh round at the same venue in June, extending his unbeaten run in the paid ranks to 17 wins, all inside the distance. Molina becomes the latest man to attempt to derail the Olympic Gold medal hero, the Texan is looking to get his hands on the top prize in his second World title tilt after challenging Deontay Wilder for the WBC crown in June 2015. The 34-year-old enters the bout full of confidence after travelling to Poland and knocking out Tomasz Adamek in the tenth round of their clash for the IBF Inter-Continental strap in April. Junior lightweight Tevin Farmer, considered by many to be among the best in the world at 130 pounds, makes the first defense of his North American Boxing Federation (NABF) title when he faces Dardan Zenunaj on Friday evening, Dec. 2, at the 2300 Arena in South Philadelphia. The Farmer-Zenunaj 10-rounder tops another Philly Fight Night eight-bout card which begins at 7pm. Farmer, 26, of North Philadelphia, is unbeaten in his last 16 fights and looking to get a shot at a world title in 2017. He is ranked as high as No. 5 by the World Boxing Council (WBC) and he is fresh off an eight-round decision against Orlando Rizo, of Managua, Nicaragua, last month in the same ring. Earlier this year, Farmer (left) captured the vacant NABF 130-pound title with a 10-round decision over Mexico’s Gamaliel Diaz. He followed that this summer with the biggest win of his six-year career when he thoroughly trounced Ivan Redkach, of Los Angeles, CA, at the Barclays Center in Brooklyn, registering a near shutout over 10 rounds. Zenunaj (right), 29, is originally from Albania. He turned pro in Belgium and now fights out of Oxnard, CA. A pro for five years, he has a 12-2 record (9 KOs) since turning pro in 2011. Zenunaj won the Belgian featherweight title in his seventh fight and two years ago he captured the World Boxing Association (WBA) International junior lightweight title when he knocked out Karim Chakim, of France, in nine rounds. The seven-bout undercard includes a terrific pair of six-round fights. Former cruiserweight world-title challenger Garrett Wilson, of South Philadelphia, goes against stylish Lamont Capers, of Hawley, PA, in one six-rounder. The other features a pair of rising Philadelphia lightweight prospects—Avery Sparrow and Steven Ortiz–in the kind of old-fashioned early career showdowns that made Philly a great fight town. Also returning are junior middleweight Isaiah Wise, welterweight Hasan Young and the local debut of Russian flyweight Basyzbek Barartov. What are your thoughts going into the fight? “I’m very excited. It’s been six months since my last fight. It’s my first headline fight and hopefully not my last one. You’re now a ranked fighter; are you happy with the pace of your progression? What do you think of the welterweight division? Why did you chose to move to Southern California? Is there pressure on you when you fight? Do you follow your Olympic teammates? How did it feel going 10 rounds for the first time? How did you end up training with Eric? “I trained with Freddie Roach for about two and a half years when I met Eric at Wild Card West Gym. I started sparring with some of his guys there. After my fight with Rodriguez on ESPN in 2015 I asked Eric to train me and we started working. Now that I’ve fought two fights with him as my trainer, I feel my boxing skills are better, I feel more powerful and I enjoy training in his gym. Boxing is in your blood; your dad and brother boxed. When you were younger, did you think you were going to become a fighter? Your ShoBox fight falls on your father’s birthday; do you have a special present in mind for him? On Saturday night Al Haymon’s Premier Boxing Champions will put on one of their best cards on network television of the year as Keith Thurman defends his WBA Welterweight Title against Shawn Porter in the main event of the evening. 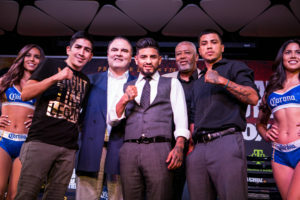 Abner Mares was originally scheduled to face Jesus Cuellar in the co-main event of the evening, but an injury to Abner Mares forced him to withdraw. Instead, fight fans will be get to see two prospects battle it out in the junior middleweight division when Jarret Hurd takes on Oscar Molina. The Barclays Center in Brooklyn, New York has been a boxing hotspot since the Barclays Center inception and it will be the host site for Saturday’s fight card. Jarrett “Swift” Hurd first burst into the national spotlight when he scored an upset stoppage victory over Frank Galarza, and win over Molina could lead to a big fight in the junior middleweight division. His opponent, Oscar Molina, will be the third straight undefeated opponent he has faced in a row and is also known for his power. Hurd has stopped eleven of his opponents and four of his past five fights failed to go the distance. Molina has ten stoppage wins, and three of his past five fights failed to go the distance. Hurd is twenty five years old and Molina is twenty six, but Hurd will have a four inch height advantage and a six and a half inch reach advantage. They both have been very active the past two years. Hurd fought three times in 2015 and four times in 2014 while Molina fought twice in 2014 and four times in 2015. Hurd has the better professional record so far. He has beaten the likes of Jeff Lentz, Frank Galarza, and Eric Mitchell. He’s also never been knocked down during his professional career. Molina has not beaten many names of note, but has defeated the likes of Adrien Torres and drew with Domonique Dolton. The only noteworthy advantage Molina has over Hurd is that he fought in the 2012 Olympics for Mexico. However, Hurd is in the middle of an impressive winning streak and his height, reach, and power will be too much for Molina to handle over the course of ten rounds. The main event of the evening is the best fight the PBC can put on in the welterweight division. Keith Thurman, the current WBA Welterweight Champion, is considered by many to be the best boxer in the welterweight division now that Manny Pacquiao and Floyd Mayweather Jr. have retired. 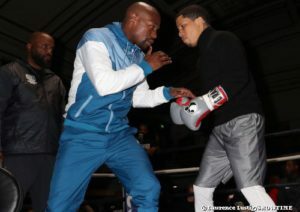 However, Shawn Porter recently beat Adrien Broner, the man many people felt would replace Floyd Mayweather Jr.
Porter is twenty nine years old and two years older than Thurman. 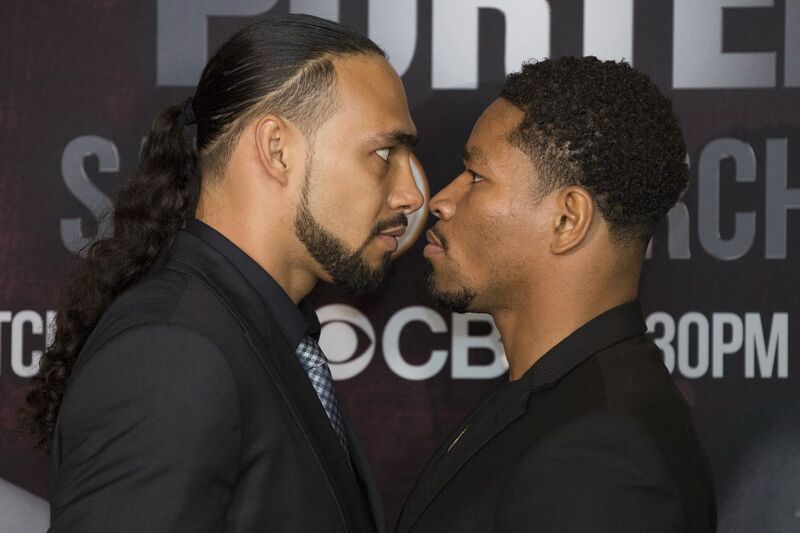 Thurman will have a slight half an inch height advantage on Porter and Porter will have a slight half an inch reach advantage on Thurman. They both fought twice in 2015 and in 2014. Thurman has the heavier hands, as he has stopped twenty two of his opponents while Porter has only stopped sixteen. However, as the level of competition that Thurman faces continues to get better his knockouts seems to be happening less often. Two of the past three opponents that Thurman has faced went the distance. Keith Thurman and Shawn Porter both experienced success as an amateur. Porter was a US National Golden Gloves Champion and Thurman was an Olympic Trials Runner Up. They both have an impressive resume as a professional. Thurman has defeated the likes of Luiz Collazo, Robert Guerrero, Leonard Bundu, Jesus Soto Karass, Diego Chavez, and Jan Zaveck. Porter has defeated Adrien Broner, Paul Malignaggi, Devon Alexander, Phil Lo Greco, and Alfonso Gomez. Porter’s lone loss was to Kell Brook. This should be an excellent fight and could go either way. Thurman has to be considered the favorite based on his undefeated record and power. Porter is a physical and in your face type of boxer, but he can get sloppy at times and Thurman is the type of boxer that will eat up your mistakes. BoxingInsider managed to get in a few questions with Jesus Cuellar and get his side of the story and how he feels about facing his former trainer Robert Garcia in his upcoming bout versus Abner Mares for his WBA world featherweight title. BoxingInsider: I’ve gotten the chance to ask Robert if he’s taking the fight with you personal being the way that you guys left things. How do you feel about this fight? Robert says it’s not personal but how are you taking this fight? Jesus Cuellar: The same, it’s business. Me and Mares are both professionals and we’re going to demonstrate our best in the fight. BoxingInsider: Is there any pressure there to have success being that Sergio Martinez is long retired. (Marcos) Maidana looks like he’s not coming back anytime soon. Is there any pressure to carry the torch for the Argentinian boxing scene? Jesus Cuellar: No, no, for me there’s no pressure. I train in the gym with my team and the flag is always risen. In the ring or in the gym. BoxingInsider: Just as he’s facing Abner Mares, (Leo) Santa Cruz is facing (Carl) Frampton. It’s kind of a tournament to see who’s the best 126lbs. How does he feel about that fight, Santa Cruz vs Frampton? Jesus Cuellar: It’s a great fight and Leo (Santa Cruz) is a great fighter. He’s going to be victorious but I will show to each and everyone of them who’s the best fighter in the division. 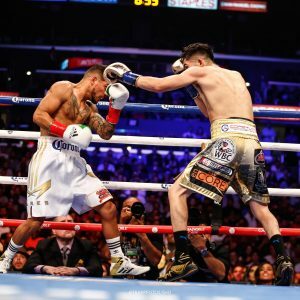 BoxingInsider: Not looking past Mares but in the future if, Santa Cruz beats Frampton would you like a showdown with Santa Cruz to prove who’s the real WBA champion? Jesus Cuellar: Yes but first we have our fights and if I get past Mares than yes, I would love a fight against Santa Cruz. Jesus Cuellar vs Abner Mares is apart of the Keith Thurman vs Shawn Porter card a “hybrid” broadcast dubbed Showtime championship boxing on CBS. Basically brings Showtime programmed boxing to “free” television around the world. Feeding off the “free boxing 4 all” vision Premier Boxing Champions has brought to millions of fans all over the world since its inception. With a win Jesus Cuellar looks to set up a mega showdown with Current WBA Super World featherweight champion in Leo Santa Cruz who he, himself has the heavy task of vanquishing Carl Frampton who’s making the move up in weight from 122lbs (Super Bantamweight) to 126lbs (Featherweight) in the process giving up his WBA & IBF 122lbs titles for the lucrative opportunity to face Santa Cruz. As for Abner Mares, he’s aiming to become a 4 time world champion and avoiding what many critics feels could be his last opportunity to prove he’s still a “A level” fighter, his words, not ours. 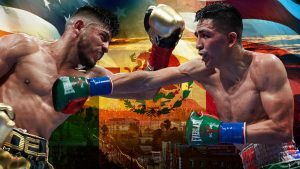 Abner Mares also used the same punchline when he fought Leo Santa Cruz at the Staples Center in front of 13k fans, stating, “Leo Santa Cruz is a fighter who has fought nothing but C-level fighters. 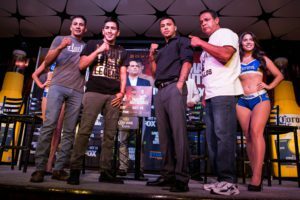 Now he’s fighting an A-level fighter…” In his fight against Santa Cruz Mares didn’t stick to the game plan but feels with Robert Garcia in his corner things will play out much more different. If Abner Mares wants the opportunity to make things right with Santa Cruz he has to get past Cuellar, the “mini Marcos Maidana” according to Showtime executive vice president Stephen Espinoza. So tune in this June 25th for an action packed card at Barclays Center in Brooklyn, N.Y. make sure to use hashtags #PBCONCBS #CUELLARMARES on social media to follow all coverage on fight.